Swingtopia will be playing two sets starting at 8:00 every Monday night in March at the Greek Village Restaurant, next to the Colesville Giant at the intersection of Randolph Road and New Hampshire Avenue. There's plenty of free parking. The food is excellent and there's even a small dance floor. We'll be playing some great swinging octet arrangements of songs from the big band era for your dancing and listening pleasure. If our first month goes well it may become a regular thing, so please come if you can. 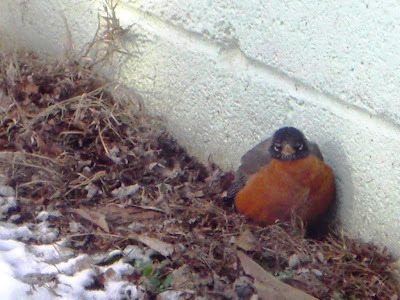 As I was picking up my bass this morning I looked out the window and saw a robin sunning himself against the back wall of the Cinderblock Chalet. He's all puffed out. I've never seen such a plump robin before! And then I was almost all the way back home from my rehearsal when I suddenly saw a man in a oilcloth duster riding a black steed down New Hampshire Avenue. The day is still young - who knows what I'll see next? Have a great weekend! The weather's been so gloomy lately and I'm extra relieved that the snow storm missed us today. There's still a ridiculous amount of snow left over from last time. I saw huge mountains of snow piled up in Olney yesterday. Thankfully the snow is only about a third of what it was in most places. And the birds are starting to come back. 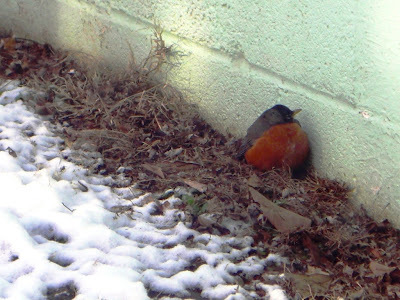 On Sunday I saw a flock of 16 robins, but I didn't have my camera with me until yesterday. I hope that they'll be sticking around now that they are here. And the local hawk is back up on his wire, staring down the mice and other critters. My least favorite season is almost over! I haven't had the time or the energy to post in a while - we've been too busy shoveling out of one place and into another. When we finally made it into our house we were in such a huge hurry to get most of the rest of the basement drywall mudded, sanded, and painted, that we decided to just ignore this situation just outside our back porch for the time being. Yuck, more work for us, just what we need. Yesterday we finally shoveled around far enough in the back to see the extent of the damage. It looks like the roof survived just fine, but the bottom section of our cedar tree has been rather severely and crudely pruned by the heavy snow. So in addition to the work on the house ALWAYS taking longer than either of us could possibly expect, we are going to have to clear these branches out of the way in order to move in. It's pretty obvious that we won't be able to move in by the end of this month. So that's another month of rent we'll have to pay. The snow has really held us back. Those are some big branches that came down! Elsewhere in our back yard, a woodpecker sits at the end of yet another broken off tree branch. Speaking of trees, I'll be playing in the pit for Scott Joplin's rarely performed opera, Treemonisha, next weekend. The music is lovely - operatic ragtime, if you will. And the singer who plays Treemonisha has an absolutely gorgeous voice. By about 4:oo we were tired of being cooped up and the snow seemed to be tapering off so we went outside and did four hours of shoveling. Well I did, anyway, because I was determined to make it out to the street. Doug pooped out and went in to cook some delicious black beans and rice. I finally made it all the way out to the street so tomorrow we can go for a walk, or shovel some more and go work on our house. It was great to be out in the fresh air and snow, getting some exercise after having worked in the basement for the past couple of weeks. It almost felt the same as skiing, except it was cheaper and not as much fun. But there was no risk of injury and the exercise felt good. I think my car is more than halfway dug out. It'll nice to have options tomorrow instead of being totally trapped. Here's the Cinderblock Chalet looking more attractive than usual in the snow. Look at all that snow on top of the trash can. Here's a perfect song for a day like today, Claude Thornhill's beautiful arrangement of "Snowfall" which became his theme song. This arrangement was going to be the closing tune at the gig at Glen Echo last Saturday which was cancelled due to guess what? Snowfall. Here's a possibly even more gorgeous arrangement of this beautiful tune which I first became aware of thanks to Washington Cube. Enjoy! Is it ever going to stop snowing? It's been so icy cold lately even when the sun finally decides to come out. I guess the weather feels like it needs to make up for the pleasantly mild winter we had last year. Today was the birthday of my very favorite groundhog. We had a very low key celebration at the start of the day, which began shortly after midnight. Last night I finally got a shot of the deer who lounge around in my back yard most nights. The one in the middle decided to get up when he saw my car. The one on the right seems to be completely unphased by the headlights aimed at him while he's relaxing on the ground. The one on the left is munching on my neighbor's azalea bush. And that somehow inspired me to go for an impressionistic effect instead. I think I've been snorting too much drywall dust lately, or breathing too many paint fumes. I'm definitely starting to hallucinate again.